It was the exhilaration of new parenthood that first united Michael and Paul, outside the Brooklyn hospital where their wives, Rebecca and Jenny, had exiled them from the delivery room. For Paul, though, tragedy swiftly followed that euphoria. Hoping to speed his and Jenny's recovery, he turns to Michael for a favor, unwittingly kindling the spark of connection between these couples into the affair that will blow them apart. One year later, on the same morning that the catastrophes of their personal lives come to an explosive head, a mysterious crisis in Midtown Manhattan all but shuts down the city, leaving both men stranded--Michael at the northernmost tip of the island and Paul in a dark subway tunnel under the East River. Each must make the arduous trek home through record-breaking heat, nervously eyeing the thin plume of smoke above the skyline, though it's their private turmoils that loom largest. 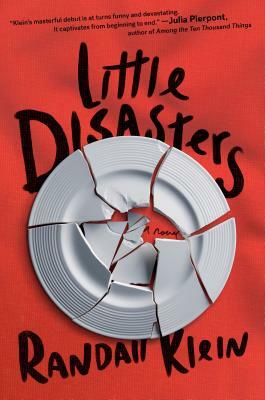 Told in the alternating voices of these charismatic but deeply flawed men, Little Disasters deftly cuts between the suspense of the citywide disaster and the history of secrets, lies, and losses that has brought these four intertwined lives to the brink. Smart, unsparing, and bitingly funny, Randall Klein's debut is an engrossing story of the bonds of love and family--and our unending urges to test them, even when we need them most. Randall Klein is a writer and book editor living in Charlottesville, Virginia. Little Disasters is his first novel.